Preheat oven to 350 °F, 15 minutes in advance. Keep a deep mold for the bain marie ready and with water. Place it in the oven, in the middle rack. Pour 1cup sugar and 2 teaspoons water in warm pan over medium heat. Constantly stir sugar until it browns and becomes caramel. Quickly pour into your flan mold and let it cool while you prepare the flan. In a mixer, blend all the ingredients in the order they appear in the list. Add 1/2 cup sugar if desired. Pour the mix in the mold with the caramel and bake for 45 minutes. Let it cool before letting it rest in the refrigerator. Garnish with strawberries, kiwi or cranberries. You can replace cream cheese with mascarpone or any type of other cream cheese. Make sure the cheese is room temperature so that it blends well, without lumps. 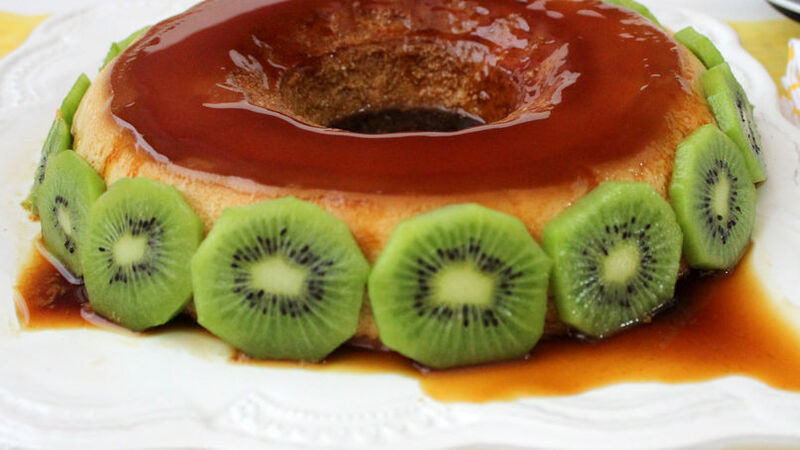 Flan is a staple dessert in our island. It comes in diverse flavors ranging from pumpkin, guava, coconut, pineapple and the traditional vanilla to low-calorie versions and, of course, one of my favorites: cheese! Cheese flan is always a great option to delight your guests. It’s a tasty dessert, no matter the flavor you choose!